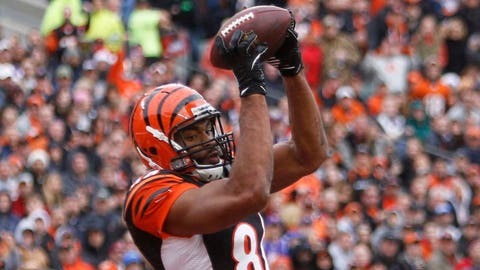 Jermaine Gresham and fellow tight end Tyler Eifert are listed as questionable for Sunday. CINCINNATI — The Bengals aren’t 100 percent healthy heading into Sunday’s AFC Wild Card game against San Diego but they had everyone available to them practicing in some capacity Friday and are optimistic of their playing status this weekend. Cornerback Terence Newman practiced for the first time since spraining his left knee against Indianapolis on Dec. 8. He was limited and is listed as doubtful for Sunday. He missed the final three games of the regular season and was replaced by Dre Kirkpatrick in the starting lineup. Kirkpatrick missed practice on Thursday due to an illness but returned on Friday and is listed as probable to play. The Bengals had eight players out of practice on Wednesday and two more limited but everyone except Newman was listed as full participation on Friday. "That was expected," said Lewis. "We knew where we were going to be and the guys did a good job of getting back to work." Center Kyle Cook (foot), defensive end Wallace Gilberry (concussion) and tight ends Tyler Eifert (neck) and Jermaine Gresham (hamstring) are all listed as questionable for Sunday. Eifert and Gresham did not play last week against Baltimore because of their injuries. Left tackle Anthony Collins (ankle), safety Chris Crocker (knee), wide receiver A.J. Green (knee), Kirkpatrick, linebacker Vinny Rey (ankle), right tackle Andre Smith (ankle) and left guard Andrew Whitworth (ankle) are all listed as probable. "It’s been unique," said offensive coordinator Jay Gruden about practice this week. "We’ve had a lot of guys banged up so there’s different guys in the huddle. It’s been weird not knowing who is going to play. You assume everyone is going to play but when they’re not out there you’ve got to make due. Luckily we’ve run through all these plays throughout the year and we’ll be able to prepare. If anyone isn’t available, we’ll be able to adjust." Gresham and Eifert are expected to play against the Chargers but veteran Alex Smith is out for the playoff after suffering a dislocated wrist against Baltimore. Orson Charles stepped in and played his most extensive amount of the season last week. Charles made the team in training camp as an H-back and special teams player. "He did good," said Gruden. "We asked him to do a lot. He hasn’t played a lot of tight end this whole season because we’ve had Alex, Jermaine and Tyler but he came in and filled in and didn’t have any mental busts. He did a nice job." Charles caught his first pass of the season against the Ravens for eight yards. "It means a lot to show the coaches that I am capable of playing football and playing tight end, and if anyone goes down or gets hurt, they can put me in," said Charles after the Baltimore game. "I have to keep capitalizing and correct the little mistakes I had and move forward. It’s playoff time. I’ve got to get another notch up." GOING INSIDE: The Bengals traveled to the University of Cincinnati and used its indoor practice facility on Friday. Temperatures were in the teens Friday morning and early afternoon. According to Weather.com there is an 80 percent chance of snow on Sunday. That’s not exactly the same conditions of the Freezer Bowl game the last time the Bengals and Chargers met in the playoffs on Jan. 9, 1982 — the temperature was minus-9 degrees with a wind chill of minus-59 degrees — but it’s not ideal either. Regardless, both teams will play in the same conditions. "We’ve got a lot of practices out there and have played in the cold," said wide receiver Marvin Jones. "That’s just our territory. Obviously they’re in San Diego. It can be an advantage but at the same time they went up to Denver (and won). It really doesn’t matter. It’s us preparing how we always do and doing well like we always do." ALL-PRO: Green and linebacker Vontaze Burfict were each named to the Associated Press All-Pro second team, announced on Friday. It was Green’s second consecutive selection to the second team, while Burfict continues to receive accolades for his season. Both were named to the Pro Bowl last week, while this week Burfict was named the Bengals’ MVP by the local chapter of the Pro Football Writers of America. Burfict led the NFL with 171 tackles (he was credited with 204 tackles by Cincinnati coaches on film review) and was the most standout presence on a defense that finished third in the league in yards allowed per game (305.5) and tied for fifth in points allowed per game (19.1). 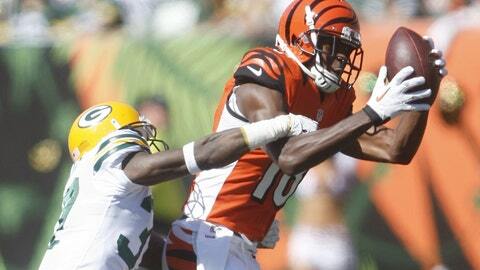 Green ranked fifth in the NFL with 1,426 yards receiving and was sixth with 98 receptions. He was just 15 yards shy of setting a franchise record for receiving yards and had a franchise record six 100-yard games, including five consecutive at one point. He caught 11 touchdowns, giving him 29 for his career.